Parks are for people,” Frances Vandervoort told me. A board member and Committee Chairman of the Hyde Park Historical Society, she holds a similar position on the Jackson Park Advisory Council (JPAC), a watchdog organization for the South Side park of the same name. That’s what I’ve come to talk with Vandervoort about: the changes that will soon come to Jackson Park. The first signs of these changes are visible even today—a nonprofit called Project 120 Chicago, in partnership with the Chicago Park District and the U.S. Army Corps of Engineers (USACE), has partially underwritten a series of revitalization projects taking place in the park since 2013. These are forerunners of more significant changes to come: the Obama Presidential Center (OPC) is slotted to open in Jackson Park in 2021, and the Tiger Woods–designed revitalization of the Jackson Park and South Shore Golf Courses—which will combine them into one PGA-grade course, and will be financed through a public-private partnership—is expected to be completed by 2020. Both projects have been sources of controversy. Before talking about either project, Vandervoort shows me a copy of a map of the 1893 World’s Columbian Exposition. The Exposition took place in Jackson Park and on the Midway Plaisance, two components of the tripartite South Park System. Washington Park was the third. Her turn to the past is a useful one: in order to understand much of the rhetoric surrounding the Jackson Park projects, a consideration of the park’s founding is necessary. After all, everyone is talking about it. In public statements and on their respective websites, Project 120, the Obama Foundation, and TGR Design (Tiger Woods’s firm) have all invoked the vision of landscape architect Frederick Law Olmsted, the park’s designer, or at least the 1893 Columbian Exposition he had a hand in designing. Olmsted’s vision was anchored as much in the physical landscape of Chicago as in its social one. Parks, for Olmsted, were more than just natural space: they were essential organs of morality and democracy, which he sought to bring to the expanding industrial labor class of Chicago. So Vandervoort’s assertion that “parks are for people” was a twofold allusion: to recent concerns about the undemocratic process by which the District has approved these Jackson Park projects, but also to the egalitarian philosophy of Jackson Park’s designer. Project 120, the Obama Foundation, and TGR Designs aren’t the only ones invoking Olmsted’s name. Organizations opposing the OPC and the Tiger Woods golf course have worries that the oncoming—and arguably incongruous—changes threaten the “character” that Olmsted initially envisioned for the parks. Which raises the questions: what was Olmsted’s vision? And can a proper understanding of it give us perspective on the debates that Jackson Park is embroiled in today? In 1869, Paul Cornell—founder of Hyde Park Village, which would remain separate from Chicago until the 1880s—and others pushed the South Park Bill through the Illinois State Legislature. According to Cornell, the bill would bring “lungs to the great city and its future generations.” The South Park Bill and a number of others inspired by it set up park commissions around Chicagoland, including the South Park Commission (all would be combined into the Chicago Park District during the Great Depression). The following year, the South Park Commission contracted Olmsted and his partner Calvert Vaux to design the South Park System. Olmsted’s democratic vision of parks was influenced by transcendentalist thinkers like Henry David Thoreau and Ralph Waldo Emerson, whose philosophy posited that an enlightened state of being could be found in nature. Olmsted was known to frequent the lectures of Emerson, who taught that nature had a sublime power and that contact with it could help people achieve spiritual understanding. For Olmsted, the lake was what gave the South Park System its sublime quality; otherwise, he was unimpressed with the landscape. Back then, Jackson Park was essentially swamp and dune, and everything west of the dunes was monotonously flat, apparently the “first obvious defect of the site.” The lake, on the other hand, was something special: “There is but one object of scenery near Chicago of special grandeur or sublimity, and that, the Lake, can be made by artificial means no more grand or sublime.” Olmsted and Vaux wanted to use lake water to unite the entire South Park System into one comprehensive unit. They designed a system of waterways and canals to do so, inspired by the Lido in Venice. Lake water would be channeled into a lagoon located in the “Lower Division” (now Jackson Park); this would connect to a basin running the length of the “Middle Division” (now the Midway Plaisance); the basin would pour into “the Mere” (now the Washington Lagoon), located in the “Upper Division” (now Washington Park). “It locks the three divisions of the Park into one obvious system, so that their really disjointed character will be much less impressed upon the minds of observers passing through them,” Olmsted, Vaux & Co.’s 1871 report stated. The Great Chicago Fire of 1871 destroyed the South Park Commission’s office, and with it with most of Olmsted and Vaux’s drafts. Plans had to be reconstructed from memory, and progress on the project largely came to a halt. A year later, the project was given over to H.W.S. Cleveland, an associate of Olmsted. Cleveland was told to minimize the parts of Olmsted’s design that required too much topographical alteration, ostensibly for economic reasons. This meant that the basin of the Middle Division and the lagoon in the Lower Division were not to be. By 1874, most of Washington Park was open and had become quite popular among city and suburban residents alike. In contrast, Jackson Park and the Midway underwent only modest development before the 1890s. The World’s Fair of 1893 would provide the impetus to change that, however. The World’s Fair was announced in 1891. Daniel Burnham, whose own architectural legacy is embedded in Chicago’s landscape, was named Chief Architect of the fair, and he appointed Olmsted (without Vaux) as its Landscape Architect. Olmsted didn’t initially envision the fair taking place on Jackson Park and the Midway. North Side sites like Garfield and Lincoln Park were also candidates, but were ultimately ruled out by the Exposition Authority due to the South Park System’s superior public transportation lines. The South Park Commission lobbied hard to get the Authority to select Jackson Park and the Midway over the already developed Washington Park; the fair meant an opportunity—in the form of an influx of capital—to finally finish Jackson Park. For Olmsted, it meant the revival of his original vision of a Venetian-style pleasure ground in Chicago. Economic reasons were at play with the Midway as they were with Wooded Island, about which Olmsted also expressed concerns. Wooded Island was not included in the original plans for South Park, but was seen as a necessary escape from the bustle of the fair. As he wrote to Inland Architect, he intended Wooded Island to be “free from buildings and from all objects that would prevent it from presenting, in connection with the adjoining waters, a broad space, characterized by calmness and naturalness, to serve as a foil to the artificial grandeur and sumptuousness of the other parts of the scenery.” The installment of the Japanese Ho-o-oden temple and gardens was therefore the best outcome of a bad scenario. “We became convinced that it would be impossible to resist these demands …[to use Wooded Island for] a great variety of purposes,” Olmsted wrote. “We were fortunate in securing the occupation of the island only by the temple and garden of the Japanese…Nevertheless, we consider that these introductions have much injured the island.” This development of the Wooded Island was also the result of moneyed interests; Japanese investment in the fair was second only to that of Germany. Despite his qualms, Olmsted was ultimately satisfied with the Exposition, and grew to be famous for his work on it. Within a year of the fair’s closure, a series of fires razed almost everything to the ground, giving Olmsted the opportunity in 1895 to redesign Jackson Park. Once again he tried to unite the South Park System into one comprehensive public park. And true to form, he again suggested that it be a waterway system to unite the three parks. Although the Commission began construction on the Midway for the canal he proposed, it was never finished, leaving a large dip in the Plaisance that still exists today. Olmsted and his sons undertook a number of other projects in the parks, most of which no longer exist. A music pavilion, for example, was installed on the northeast bank of the lagoon, where, more recently, Project 120 has proposed the construction of a new music pavilion. Although Olmsted’s pavilion is no longer, Jackson Park’s eighteen-hole golf course—one of the first public golf courses in the Midwest, designed in 1900 by John C. Olmsted, Olmsted’s nephew and adopted son—is still there today. The South Park System has changed considerably since Olmsted’s time. Some changes occurred suddenly: the original Ho-o-oden temple fell victim to arson in 1946, although the Garden of the Phoenix, added to the site in the 1930s as the Osaka Garden, remains. Others faced resistance from residents, to varying degrees of success: in 1959, protesters chained themselves to trees to (successfully) block Mayor Richard J. Daley’s reroute of Lake Shore Drive through Jackson Park. Protesters failed, however, to block the construction of a golf driving range in 1978. Vandervoort herself was present at these protests. Beyond a significant architectural history, the South Park System has a history of organizing and dissent. It’s a tradition that continues today. Fast forward to the present day, I take a stroll over to Wooded Island, a location that has recently been the focus of public outcry. It’s my first time back since Project 120 Chicago—whose signs are posted all over—began their restoration of the area in 2013. Adjacent to the Garden of the Phoenix stands Yoko Ono’s lotus-shaped sculpture, Skylanding, which was also underwritten by Project 120. Some are more skeptical, not just about Project 120, but about all of the changes that have been proposed for Jackson Park. When I asked Ken what he has heard about the Obama Presidential Center (OPC), his answer was telling: “I was at an alderman’s meeting…It seemed like nobody knew what was going on.” Ken is not alone in his concern that “the alderman didn’t have any answers.” A few organizations have coalesced around this perceived lack of transparency in the the Park District’s decision-making process for Jackson Park. These organizations allege that secrecy has shrouded not just the decision-making process for the OPC, but Project 120’s restoration and the golf course revitalization as well. Many fear that the precedent set by Project 120—already well under development by the time the library and the golf course were announced—will be a forerunner of things to come. Chief among these parties is Friends of the Parks (FOTP), a watchdog group that monitors the Park District’s activities. These activites have increasingly taken the form of public-private partnerships, as wtih GLFER project. The introduction of private capital has caused some—Juanita Irizarry, executive director of FOTP, for one—to worry that moneyed interests have usurped democracy in decision-making about the parks. FOTP works to give communities political sway over their parks, in part by helping them form Park Advisory Councils (PACs), which are community groups that advocate for the needs of their local park. They began cropping up in the 1980s—a few years after FOTP was founded in 1975—after the U.S. Department of Justice sued the Chicago Park District for its racist neglect of minority communities. As a result, a 1983 court-ordered consent decree required the District to create a system by which the public could hold government accountable for park spending. FOTP was contracted to help implement this system, which it did by recommending the PAC model. They have helped to establish about 200 PACs; JPAC, founded immediately after the 1983 court order, was one of the first. Some members of JPAC—for example, Vandervoort—are more supportive of Project 120 than is FOTP. Project 120’s discussions with the District about building the Phoenix Pavilion and music court on the northeast bank of the lagoon, where Olmsted’s pavilion once was, were ultimately stymied by community backlash. Irizarry credits a new organization on the scene, the Jackson Park Watch (JPW), for this disruption. “[The District] had a little opposition from the Jackson Park Watch, so it seems as if that opposition has slowed some things down,” she said. Brenda Nelms and Margaret Schmid founded JPW last year primarily as an information-gathering organization, distributing knowledge that they believed the community had a right to know. For example, they filed a FOIA request with the Chicago Parks’ District earlier this year and found that, in return for a $700,000 capital investment, the District had signed a Memorandum of Understanding (MOU) with Project 120 that “gave Project 120 control over the north end of Wooded Island and the part of the park surrounding the lagoon,” Schmid told me. The MOU can now be found on JPW’s website. Organization like JPW and FOTP are concerned that the non-transparent and undemocratic precedent set by Project 120 will be an issue with the OPC and the golf course as well, particularly worrisome because of the risk of gentrification that the latter two projects could bring. In a recent presentation, Obama said he hopes the center will turn Jackson Park into something of a Millennium or Lincoln Park, or, in Nelms’s words—“congested, carnivalesque, programmed”—a tourist attraction without regard for the needs of local residents. “I don’t think any of us have anything against…bringing economic development to the community,” she said, but she adds still “concerned for the community in the area that has worries they might be displaced.” “It’s not an improvement [to the park] for the folks who live nearby if they can’t live nearby anymore,” she said. Making sure the surrounding community has a say in how the project unfolds will be FOTP’s role until the OPC is unveiled in 2021. Irizarry sees a direct connection between the OPC and the golf course revitalization project. But the promise of economic development has been polarizing. “We hear from folks who are excited about what they perceive to be economic development,” Irizarry said. “And we hear from people who are afraid that they will no longer be able to golf here at a lower price as they do now.” The city has reassured the public that the revitalized golf courses will be subsidized for local residents; as of now, however, the amount by which the price per round will increase is uncertain. Among those who use Jackson Park, opinion is similarly split about the two projects. Ken affirmed that he was concerned about “gentrification—is it going to make [the area] more expensive for the people?” he asked. When I spoke with a group of three golfers over at the Jackson Park Golf Course, they seemed excited about both projects, although a bit skeptical about whether the necessary capital will materialize to make the golf course revitalization happen. Nonetheless, they seemed excited about the economic development it could bring. “Once the golf course comes in, then private enterprise will figure out how to fill in the rest,” Edward Singleton said. Albany Devers added that private enterprise is “going to improve [the neighborhood].” But Singleton and Devers were not residents of the Kenwood/Hyde Park/South Shore area; rather, they had commuted in from their homes in the suburbs. Many of the issues surrounding the park projects today were immaterial in Olmsted’s time. “He would not recognize today’s world,” Irizarry reminded me. Nonetheless, Olmsted’s legacy—and the legacy of his contribution to the Columbian Exposition—are cited by almost all of the actors doing work in Jackson Park today (take a look at their websites), which means the designer’s intentions are more than relevant. I turned to Victoria Post Ranney, a well-known Olmsted scholar and the author of Olmsted in Chicago, for input. Ranney thinks it’s important “for Jackson Park to be really revitalized.” Despite the heated resistance with which the proposed changes have met, Ranney told me she didn’t “think that we should think of Olmsted Parks as something that should never change.” Nor are the projects being implemented today necessarily incongruous with those Olmsted undertook more than a century ago: after all, Project 120’s music pavilion would have occupied the location of the one he installed in 1895. Between the two projects that are cued to arrive in coming years, Ranney spoke favorably of the OPC. “[Olmsted] would have been, I think, delighted to see the kind of president Obama turned out to be, and he would have probably loved to work on this project himself,” she said. About the golf course revitalization she was less sure: “He would not like it if access was reduced by making a golf course into something that was exclusively for people that had a lot of money to pay for it.” She added an additional concern about the golf course: the question of the “effects around it,” the same concern shared by Ken and others regarding the OPC. But for the golf course that question is even harder to answer: the course revitalization project has no business plan as of yet, making it difficult to tell what development will result from the revitalization. I think that the transcendentalist in Olmsted would be wary of anything that could detract from the naturalism of a park. Naturalism, he believed, offered an important offset to the industrialized and developed character of city life. As many watchdogs have noted, the OPC would take away green space, as would have Project 120’s music pavilion. Ease of physical accessibility to the park was also important to Olmsted, something that development today poses a threat to: it remains unclear how the designers of the OPC and the golf course revitalization plan to accommodate for the inundation of traffic their projects will bring. But Olmsted saw value in a developed and programmed park, as well. The 1873 implementation of his Washington Park plan included amenities like pony rides and equipment-stocked sporting fields. 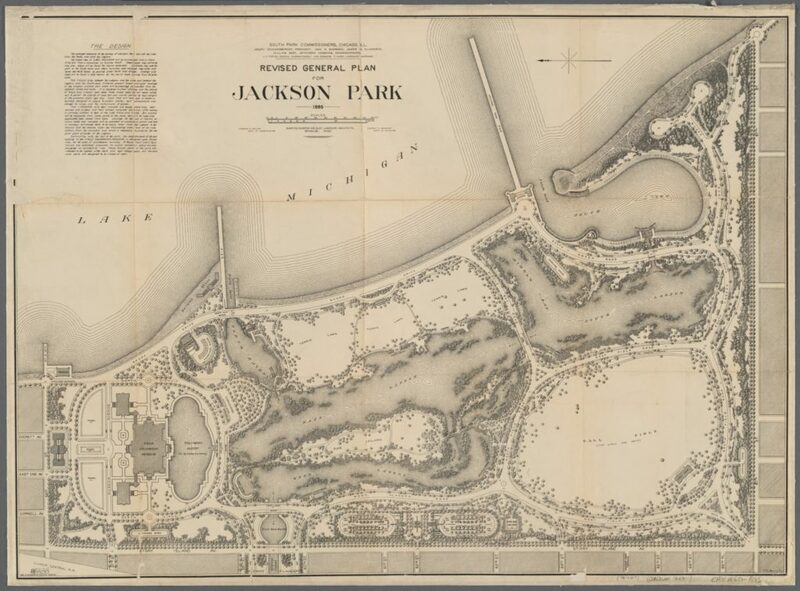 The “Revised General Plan for Jackson Park” of 1895 included, amongst other things, a music court on the northeast bank of the lagoon. More than a century later, Project 120 had initiated talks to design a music pavilion in the same location. As Ranney reminds me, it’s all “speculation.” It’s impossible to put words in the mouth of a man who’s beyond the grave. Nonetheless, she believes certain facets of Olmsted’s vision speak for themselves. “I think that the great constants in Olmsted parks are getting people in touch with…real nature.” But she wonders who will be able to benefit from this vision in the coming years. “One of the other things that was very important to [Olmsted] was access, by all of the people.” And this, she said, was her “worry” about the future of the South Park System. Check out the archive web site for Protect Our Parks at http://www.protectourparks.org. We organized and sued the Chicago Park District in 2008 over their plans to privatize part of Lincoln Park and turn it over to the exclusive (and very expensive) private Latin School. Thank you for this article. As a long time resident of Kenwood, Hyde Park and South Shore, I appreciate all of the history that you can send me. Once again, Thank You. Why dont they build the library in an area where buildings have been abandoned for years. Why is is necessary to build on a beautiful park area. It’s bad enough people are tearing down trees and animal habitats to build apartments and buildings. Build the library in an area they need one. Not in an area with a good view.